The council has been consulting on different layouts for the proposed line on Leith Walk. Trams: Plan to extend line. A final decision on the next phase of Edinburgh's tram line will be taken by December. An outline business case for a £165m proposal to take the line down Leith Walk to Newhaven was approved in September last year. Construction will cause considerable disruption, with three lanes of the street closed for around 18 months. A workshop involving local businesses, community groups and councillors was held last week as part of the council's consultation on extending the line. Different options for the layout of the line between Pilrig Street and the Foot of the Walk were considered. Attendees chose an option which included segregated cycle lanes, maximised pavements and two single lanes (one northbound and one southbound) for all other traffic. It includes space for loading and parking on certain parts of the street. Edinburgh city council will vote on the final designs by the end of the year. Further workshops will be held on other aspects of the tram line later in June. Transport convener Lesley Macinnes said: "Thursday's workshop was enormously useful and we're very grateful to everyone who's given their time and energy to help us refine the plans for taking trams to Newhaven. Andy Keba, Sustrans Scotland's Head of Strategic Partnerships, said: "We found Thursday's Trams to Newhaven workshop extremely constructive. "It is clear that the City of Edinburgh Council recognises the ambition for Leith Walk to continue to improve as a place that prioritises people. "Sustrans Scotland look forward to continued engagement with the process, and will support those measures which improve walking and cycling for the community of Leith." 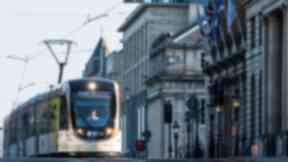 Stuart Hay, director of Living Streets Scotland, said: "The tram designs have come a long way to addressing the concerns of pedestrians and cyclists in terms of space and quality of the public realm. "It was good to see the tram team working with communities on the solutions to some challenging issues. "Hopefully, further work can meet technical and business considerations and the needs of the local community."